Chosen is an Enemy in Mass Effect Andromeda. "Chosen are the front-line soldiers of the kett, encountered on multiple worlds as support for other kett combatants. They are equipped with assault rifles that fires phasma surrounded projectiles, and light armor that allow them to move and deploy rapidly. Though their biology is still under investigation, they are capable of surviving in hazardous environments without protective gear. 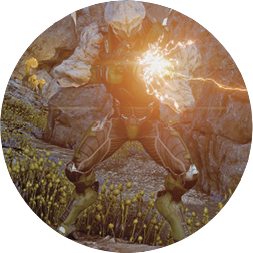 While quick to defer to more senior individuals, Chosen appear to be disciplined and loyal soldiers, undeterred even by biotic attacks or heavy ordnance. They present a continuing risk to unarmed outposts. The name Chose was intercepted and tentatively translated from kett communications. If accurate, its significance is unclear, since these are clearly the kett's baseline infantry."